Art, visual art in particular, can be used and is being used to compress messages and even narratives into short, powerful images, thus the quote “A picture is worth a thousand words”. Advertisers have cashed in using this medium, often times creating demand from nothing at all. Such is the power of this medium that it has created a multi-trillion dollar industry, regular churning out works with speed and stamina that could out-box Manny Pacquiao. The control for the use of visual arts, fortunately, have been contested – hotly at that – by activists across the globe and have made a strong stake against advertisers and marketers, who like charlatans, are selling snake-oil to the uninitiated. Activists have been leveraging visual art to explain various persuasion and advance advocacies for many decades now and this effort from social movers continue to bore fruit. This potential is what the Asbestos Street Fighters Street Art competition would like to build upon in furtherance of our campaign for the total ban of Asbestos here in the Philippines and the rest of the world. Despite long standing scientific evidence pointing to the deadly effects of Asbestos dust to the human body; despite the role of the Internet in making information sharing easier; and despite tireless work from Anti-Asbestos activists across the world, asbestos remains to be used around the globe, continually killing more and more people. We intend to maximize the dynamism of street art to package the message that death via asbestos remains a threat lingering among the human population, while allowing the same message to seep in to the habits of street artists, hoping that it becomes theirs too. Case in point, street artist A.G. Sano has taken up the cause against dolphin killings after watching a documentary video on the subject. For more details please visit www.streetversusasbestos.com. 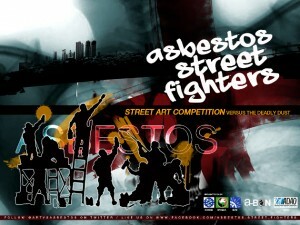 To view the message to contestants, “Asbestos Kills Peoples,” please read here. This entry was posted in Blog and tagged activism, ADAO, advocacy, art, Asbesots Disease Awareness Organization, asbestos, Asbestos Street Fighters Street Art competition, asbestos-related diseases, cancer, Global Ban Asbestos Network, Linda Reinstein, Manny Pacquiao, Noel Colina, Philippines, social media, twitter, youth. Bookmark the permalink.